UWIN is a UNIX to Windows Integration Toolkit that gives you almost all the features of a traditional UNIX operating system on Windows 7, Windows Vista, Windows XP, Windows 2000, Windows ME, and Windows 95/98. The latest version of UWIN as of this writing is version 5.0. UWIN is released under an open license which includes parts released under Eclipse Public License version 1.0, BSD license, MIT license, and GPL. UWIN package contain the following set of tools and libraries. Libraries that emulate the Unix environment. Files and development tools. Eg: cc, yacc, lex, and make. 250 other command line tools/utilities. 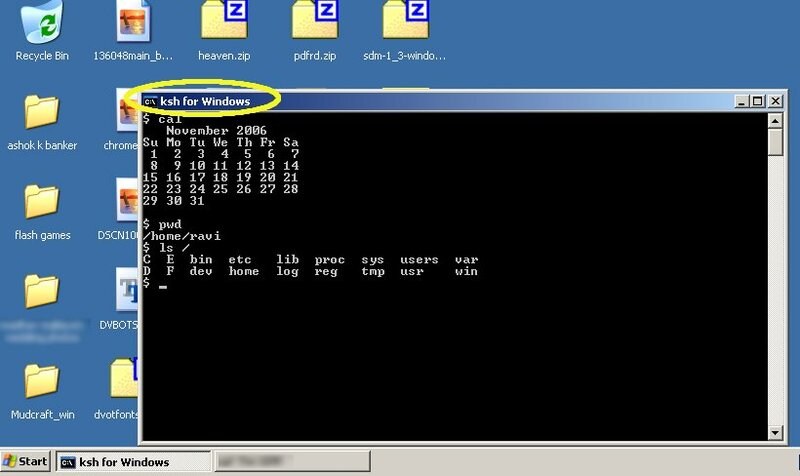 UWIN runs best on Windows 7/Vista/XP/NT/2000 with NTFS, but will run in degraded mode with the FAT file system, and further degradation with Windows ME/98/95. Korn shell - ksh - is the default shell in UWIN. When you install UWIN in Windows, it adds a link to the Korn shell as an icon on your Windows desktop. To open the Korn shell, you have to double click on the Korn shell icon. Runs in a console window. Access all the environmental variables of Windows. UWIN binaries are available in 3 packages namely - the Base package, Development package, and a few other Add-on packages. The Base package consists of the UWIN runtime libraries, shells, utilities, daemons and services. It provides a virtual UNIX environment on Windows. Install only the base package if all you need is a set of UNIX command line tools. The Development package adds application development support on UWIN. It consists of header files, libraries and development utilities like cc, make, rcs, etc. It can be used to build UWIN applications and/or to build native applications. Install this package along with the base package if you wish to develop applications using UWIN. The Add-on packages include the X11 client applications and X11 server, the libraries needed to build X11 applications, Perl 5.8, fonts, and groff utilities. UWIN doesn't offer binary level compatibility with UNIX. However, you can take the source code of a UNIX application, compile it in UWIN, and run it in Windows. You can download the latest packages of UWIN at the AT&T Research website. The actual download process is a bit tedious. However, if you persist you can successfully download, install, and run UWIN in Windows.